See that blue thing? That's a saucer that is. Shoot that and you're a wee bit closer to completing the level. But not much. There are two things which strike you when you play Encounter. The first is that it is very, very of its time: straightforward arcade shooter with gameplay which, at its heart, is only a little more complex than Space Invaders. The next is that it’s a clearly influenced by Atari’s 1980 classic Battlezone. But Encounter is not a straight-down-the-line Battlezone clone. 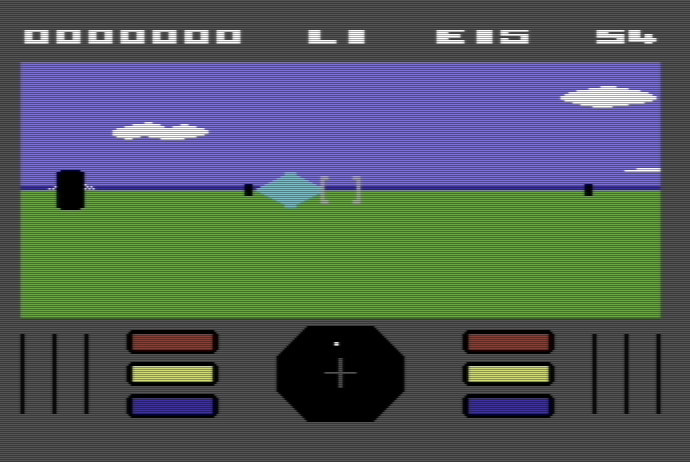 For a start, Atari’s pioneering 3D shooter was designed to be a semi-realistic simulation of driving a tank, right down to different controls for left and right “tank tracks” as in the real-life war machines. It was also, especially early on, rather slow-going with neither the enemy tanks nor the player exactly zipping around. This is the in-between-levels fly-through-the-void bit. See those spheres? Hit one of those and you have to do the level again. So don't. In fact, if Encounter is going to be compared directly to anything called Battlezone then it’s not the arcade machine that draws the closest comparison but instead the Atari 2600 version of the same. That version (available, alongside the original arcade game, on the excellent Atari Anthology) took the same basic gameplay as the arcade cabinet but made it more fast-moving and frantic, not to mention a lot more colourful even if the 3D was nowhere near as impressive. Encounter doesn’t really have a storyline to speak of: you’re on a planet somewhere and you have to defend yourself against marauding saucers and missiles. The view, as with Battlezone, is first-person and the playing area is basically a huge arena with cylindrical “obelisks” dotted around which serve as some kind of barrier against enemy fire (or a nuisance if you’re trying to move quickly). The “saucers”, the most numerous enemy you’ll encounter in my experience, is actually more like a diamond shape and appears from a square which briefly materialise in the arena before “creating” a saucer which proceeds to weave around at random firing at the player. Like I said, this game is similar to Battlezone but in many ways so very different – the enemies here couldn’t be further away from that game’s slow-moving tanks. The missiles, the other enemy in the game, are less numerous in number and you are warned of their coming by a siren. They move very quickly and home in on your position so the player needs to respond with lightning reflexes in order to shoot them in time. The game is split into levels – eight in all – with an opening to the next level appearing when you’ve successfully cleared the current one of marauding enemies. Enter the opening and the player enters some kind of “witch space” filled with spheres which need to be avoided (a la Deathchase’s trees, only you can’t slow down! ); manage this, and you get to the next level, fail and you go back to the previous one. Encounter is undoubtably of its time. The gameplay is unsophisticated, clearly owes a lot to the popular games console titles of the late ’70s/early ’80s (not just the Atari 2600 Battlezone similarities but the whole way the game looks and feels – chunky, colourful, full of blips and bloops, even selectable difficulty levels) and it’s very tough with a few things feeling a little unfair: for example, your chances against the missiles are largely down to whether you’re roughly facing them when they appear, and the whole “do the level again because you crashed into some stupid sphere” aspect is sloppy design – what’s wrong with a bonus stage instead? Having said all that, it’s quite fun to play and the frantic nature of the gameplay means it never actually gets boring, even though it does get repetitive. Not bad, then, but the sort of game left behind by the more sophisticated games just around the corner which made much more use of the C64’s abilities. This entry was posted on 24 May, 2010 at 8:41 pm and is filed under General games. You can follow any responses to this entry through the RSS 2.0 feed. You can leave a response, or trackback from your own site. 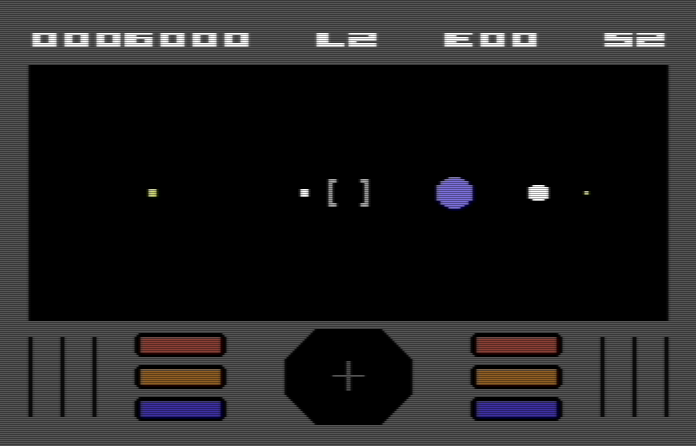 Encounter was always mentioned as the game where you could feel the difference CPU Speed of a C64 and a Atari XL (double the speed). So would be intersting, if you have a look at the XL version to see if you really feel a difference. That’s interesting, given that C64 ‘Encounter’ is pretty nippy as it is, I can’t help but feel any more speed would make it unplayably tricky. I’ll try and give the Atari XL version a shot some time soon and report back here.